State Budget and Suffield: Fortunately, the state budget recently signed by Governor Malloy will have relatively minimal impact on Suffield, after months of discussions about much more serious cuts The current Board of Finance has been extra conservative and added $2m to the Board of Education budget anticipating pension costs to all come this year. While the Board of Finance may still propose revisions, it looks most likely that there will no significant changes made. Planning: I will urge the Board of Finance to update and improve the Board’s long range financial plan. I also want to see the BoF work with the Board of Selectmen to develop a long range plan for the town facilities that includes moving the highway garage to facilitate economic development. Capital projects: Voters approved spending money for road improvements in October 2015 and we’ve seen good progress made, with at least 2/3 of the roadwork now complete. Progress on the other two projects approved at the same time has been minimal. The Town Hall renovation project has been stalled and bids for the work have not even gone out yet. The Board of Selectmen is awaiting an overdue plan to consolidate all town departments into Town Hall. Preliminary information suggests this will run an additional $3-4m, and it isn’t clear that voters are willing to pay that much more than the original authorization of $5.3m. The Bridge Street Community Center project has been halted just as the town was ready to award the project to the companies selected as the Architect and for Construction Management. The First Selectman has put a hold on the project until the state budget details are approved we know what the impact will be for Suffield. The Board of Finance did not come to any consensus on this when asked – but they should have, they are responsible for town finances. It is short sighted to delay projects approved by the voters for long because they never get cheaper to complete by waiting. Wages go up, materials costs go up, borrowing costs go up, requirements increase and once voters have approved of the project at town meeting or in a referendum, the town is obligated to move forward unless voters vote to defer or cancel a project. The First Selectman, Board of Selectman, or Board of Finance can not cancel a project. Fund balance: Compared to almost every other town in Connecticut, Suffield has a very healthy fund balance (or “rainy day” fund). The fund balance is the money raised by the town through taxes and fees that has not been approved for use in the yearly budget approved by voters. Typically, Connecticut towns average a fund balance of about 8-10% of their yearly budget. For Suffield, that would be about $5m. Instead we have around $11m or 20%. Having such a high fund balance means that taxpayers have been asked to pay too much in taxes. Having too much money in the fund balance means we are actually losing money every year as inflation reduces its value. There are strict limits set by the state on how that money can be invested – and in recent years the town has earned about 0.5%/yr on all that money – when the stock market has gone up a huge amount. Extra money in the fund balance should be used to reduce taxes or for needed capital projects. Using it for capital projects means that we can get them completed for less money – and without borrowing. A high fund balance is a target for labor negotiations and also indicates to the state that grants to Suffield can be cut with few consequences. Summary: I’ve been going to Board of Finance meetings regularly for more than a dozen years now. I know the members of the Board and I know the town’s finances. I’m anxious to put my background and experience to use to continue to serve the residents of Suffield. Suffield First Selectman from 2009-2011. During that time, tax increases were the lowest in the last 15 years. Worked for Phoenix Insurance in Hartford and Enfield for nearly twenty years in the finance department and as a senior technology manager. Previous positions in business automation, computer consulting, as a science writer and as a communications expert in Antarctica. Served on the Board of Finance, Zoning and Planning Commission, and as chairman of the Advisory Commission on Capital Expenditures. 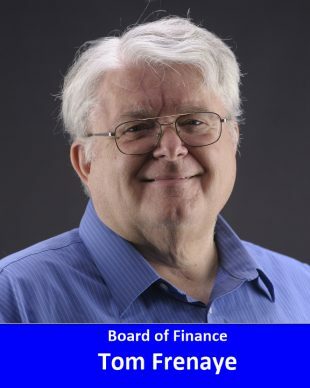 Elected to the boards of two national non-profit technology education associations (since 1985), currently serve on one as chairman of the Ethics and Elections Committee, the other as President. Current member of the Suffield Observer editorial board and volunteer for Friends of the Farm at Hilltop. Married to Kacy Colston who serves as President of the Friends of the Farm at Hilltop. We built our house on Warnertown Road in 1989. Favorite spare-time activities include travel, amateur radio and do-it-yourself projects. Contact me via e-mail at frenaye@pcnet.com or call me at 860-668-5444.